Kristy Dohnel is the Recipient of Palo Verde Republican Women’s First Arizona State University Scholarship! Palo Verde Republican Women’s club is proud to announce its first Arizona State University (ASU) scholarship endowment winner: Kristy Dohnel. The scholarship is awarded through ASU’s Political History and Leadership program. The Palo Verde Republican Women scholarship endowment fund was three years in the making. And it was exemplary vision and leadership as well as over-the-top perseverance and commitment to success by Palo Verde Republican Women Past President Joan Lang and Immediate Past President Jan Stephenson that enabled the club to fund the endowment to the tune of $64,000 (and growing), well exceeding the original goal of $25,000! As it currently stands, the endowment ensures at least two scholarships per year—in perpetuity— to be awarded to deserving conservative students attending ASU. Roxane Barwick, Manager, School of Historical, Philosophical and Religious Studies, informed the club of the school’s selection in early April. At the same time, she thanked all of the club’s members for their generosity in creating this scholarship endowment to support students in the ASU Political History and Leadership program. According to ASU, Kristy is well-deserving. She currently works for Congressman David Schweikert and was selected as one of only two women in the country for the Dorothy Andres Kabis Memorial Internship by the National Federation of Republican Women (NFRW) this summer. More can be learned about Kristy in an online article entitled History Undergrad Wins Prestigious Summer Internship in Washington, D.C. (April 2, 2019). According to the article, “Kristy Dohnel grew up in a small town of around 4,000 people; she lived in a mobile home on a 100-acre ranch. From little Bishop, California, she moved to Tempe to attend Arizona State University. Upon arriving, Dohnel didn’t know a single person on campus, but that didn’t stop her from getting involved. “She is now two and a half years into her undergraduate degree and has pushed herself to participate in the political community both on campus and off. Before attending ASU she had no prior experience in politics, just an interest in the topic. “Dohnel landed an internship on a U.S. senate campaign, where she rose to the role of campaign scheduler and became a precinct committeeman in her legislative district. At the same time, she joined her local Republican women’s club and the political history and leadership club at ASU. Palo Verde Republican Women club members are happy to learn of their first scholarship winner. And they look forward to watching Kristy’s continued success upon graduation. Congratulations Kristy Dohnel! You know it, I know it. We’ve got our work cut out for us in 2020 ! After what we saw happen in November 2018, the Democrats smell blood and will do whatever they can to turn Arizona completely blue. But who better than these two beautifully strong and intelligent women to unite us and lead the charge to ensure this does not happen! Recently elected Arizona and Maricopa GOP Chairwomen Dr. Kelli Ward and Rae Chornenky will speak to us about their plans (which will involve each and every one of us) to keep our state in Republican hands. And to ensure President Trump prevails here as well. Our president will need our Electoral College votes for sure! The cost of the luncheon is $35. Your reservation MUST be made by Friday, March 15th at 10 am to ensure a seat. For a faster check in on the day of the luncheon, please pay by cash or check! To make a reservation, send an email to pvrwlunch111@yahoo.com. You do not have a reservation if you do not receive a confirmation within 48 hours of sending your email. Contact Monica Yelin at 516.423.0330 if you have any questions. IMPORTANT: If you do not receive a confirmation of your reservation within 48 hours, YOU DO NOT HAVE A RESERVATION. If you aren’t listening to Mike Broomhead week day mornings, then you are really missing out! Tune in to 550 AM KFYI Monday through Friday from 6 to 10 am (just before Rush Limbaugh) and he will keep you up to date on both local and national political news. We hope to see you and your friends on Wednesday, January 16th! NOTE: The last day to RSVP is Friday, January 11th, by 10 am. To make your reservation, send an email to pvrwlunch111@yahoo.com. Type or copy and paste this email address into the “TO” section of your email (because too many of you were having problems with our email link, we’ve decided to provide the email address without the link). The cost of the luncheon is $35. Your reservation MUST be made by Friday, January 11th at 10 am to ensure a seat. For a faster check in on the day of the luncheon, please pay by cash or check! To make a reservation, send an email to pvrwlunch111@yahoo.com. You do not have a reservation if you do not receive a confirmation within 24 hours of sending your email. Contact Monica Yelin at 516-423-0330 if you have any questions. This holiday season marks the 55th year Phoenix Rotary 100 and others will raise money for The Salvation Army through the “Rotary 100 Rubber Band.” The band has raised $1.5 million for programs of The Salvation Army throughout their history! Laugh and Sing with the Rubber Band! 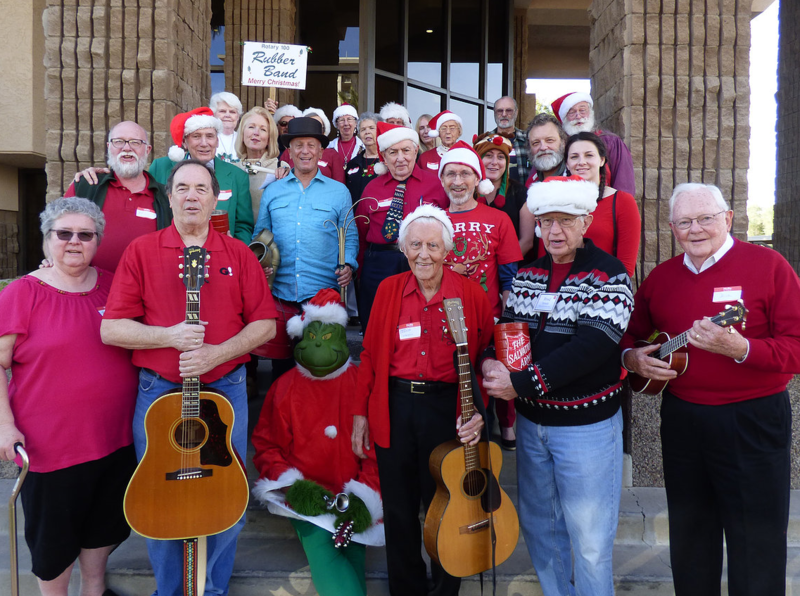 The Phoenix Rotary 100 will bring us holiday cheer and laughter when its spirited crew, the Rubber Band, serenades us on December 19th. Holiday songs new and old and dancing are the recipe for this interactive performance, as musicians on wash buckets, fiddles, bell straps, triangles and horns wear their Christmas best and the foolish but lovable Grinch frolics among all of us. After lunch, the chairman of the Phoenix Salvation Army Advisory Board, Jeff Taylor, will share with us how the Salvation Army was there for him, just when he needed it the most. I grew up playing golf, surfing, going to the University of Arizona to play football and study finance. My first job out of college was as a Wall Street stock options trader, where I earned enough to leave the business at the age of 29. Life was good. Five years later, I was living in a bush in south Phoenix. Marijuana, pain killers and cocaine wiped out my bank account. I turned to burglary to feed my habit and ended up behind bars six times. My life did not turn around until a judge sent me to a Salvation Army drug treatment program. I broke my addiction, earned a teaching accreditation and went to work for the Salvation Army. Today, I chair the board. IMPORTANT: If you do not receive a confirmation of your reservation within 24 hours, YOU DO NOT HAVE A RESERVATION. Please send another email or call Monica Yelin at 516-423-0330. Please note that our November luncheon takes place on Wednesday, November 28th. Since the third Wednesday of November is the day before Thanksgiving, we changed the date! November is the month when Americans honor our veterans. As we honor our veterans this 11th month of 2018, we need to be mindful of their struggles. Join us on November 28th, as Dr. Matthew Keene educates us on the topic of opioids and their impact on our veterans as well as our country’s general population. Dr. Keene is a veteran of the military himself and has committed his life to assisting individuals in overcoming their addictions. The opioid crisis, which killed more than 42,000 Americans in 2016, continues to devastate the country. And our veterans may be one of the populations hardest hit. Over the last eight or so years, opioid statistics suggest veterans are twice as likely to die from accidental opioid overdoses than non-veterans. In addition, treating veterans’ chronic pain almost exclusively with opioids has led to addictions and a fatal overdose rate twice the national average. Join us on November 28th to find out more about this far-reaching problem devastating our nation. The cost of the luncheon is $35. Your reservation MUST be made by Friday, November 23rd at 10 am to ensure a seat. For a faster check in on the day of the luncheon, please pay by cash or check! To make a reservation for our luncheon, contact us by email: pvrwlunch111@yahoo.com.